Microsoft Excel is one of the most powerful tools a business owner, manager, or new employee has at their disposal, and this guide teaches how to harness business data and put it to use. 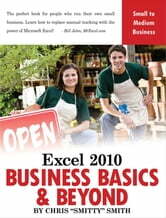 Using real-world examples of a small business in operation, the book covers topics such as preparing financial statements, how to best display data for maximum impact with formatting tools, data tables, charts and pivot tables, using customer information to create customized letters with mail merge, importing data from programs such as QuickBooks, calculating the costs of doing business with financial formulas, and much more. Helpful screenshots are spread throughout the text, and the book explains how to find ready-made templates online for free.